Can I add other Parcel in 200ft list after process? Yes, another parcel can be added after process with the help of “+Add/Remove” button in 200ft list. After process, click on button and select parcel to be added in the list. The clicked parcel will get added in the list and map. Can I remove selected Parcel from 200ft list after process? Yes, parcel can be removed after a process with the help of “+Add/Remove” button. After process is completed, double click on the button and click on the parcel to remove it. The clicked parcel will be removed from the list and map. Can I export 200ft list in excel. Yes, 200ft data can be exported in excel with the help of “Export to excel” option provided in the list. 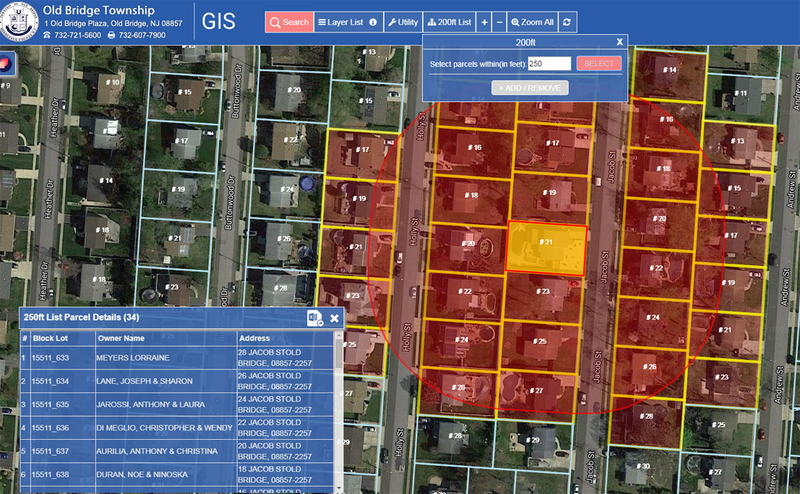 GIS has one good feature – 200ft list. Using this feature, one polygon round the selected parcel can be created and details of all the parcels can be seen under the polygon. Also, the size of polygon can be set including export details in excel as well. How to create 200ft list? 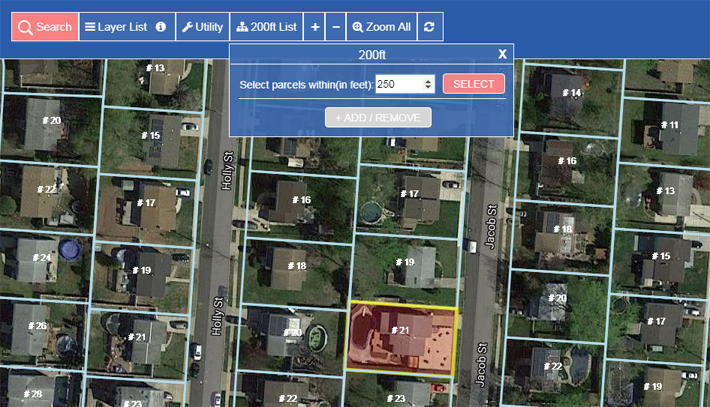 Step1: Search parcel with Block lot. Step2 : Set area range in feet from 200ft form. Step 3: Click on select button to create the polygon round the selected parcel including all data in the Parcel detail list. Step 4: To add another parcel in selected parcel, click on “ + Add / Remove” button from 200ft form and the functionality to add another parcel gets enabled. Now another parcel can be added in 200ft list by clicking on the parcel. The clicked parcel will get added in 200ft detail list. To remove selected parcel, click on parcel again. The clicked parcel will get deleted from the list and unselected from map.